RARE Gallery - Jackson Hole Art Galleries - "Native American Chief, Yellow Owl"
"Native American Chief, Yellow Owl"
When traders brought smallpox to the 1,600-some Mandan Indians of North Dakota in 1837, only a handfulperhaps 150survived. When this photo was taken in the early 1900s, Yellow Owl, pictured, was one of fewer than 300 Mandan remaining. The piece speaks to the spirit of the Tribe. The image was selected not as much as a tribute to the Mandan Indians but for the character in the face of Yellow Owl. His face tells a story through the years of survival. 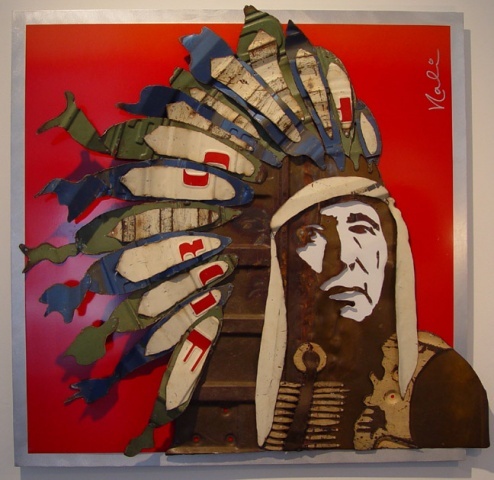 The rustic nature of his skin is depicted through the reverse side of vintage tailgates while the ornate headdress and bone jewelry are captured through the fronts of tailgates that showcase the amazing detail and colors of the traditional Indian costume.